Apple has started accepting Mac Apps for their upcoming Mac App Store. The Mac App Store was announced in October as part of Mac OS X Lion's feature set. Apple quickly revealed that the Mac App Store would also be coming to existing Mac OS X Snow Leopard users as well and would launch in 90 days from the time of the announcement. 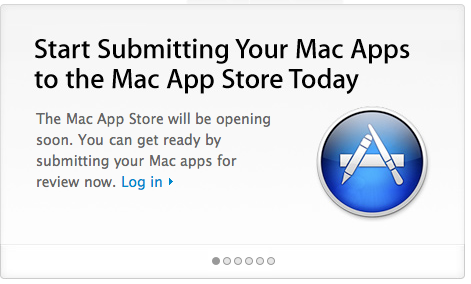 The Mac App Store mirrors many of the submission guidelines and policies as the iOS App Store. The Mac App developer program is $99/year just like the iOS App developer program.